We developed the best consumer ecommerce website in Scotland in 2000 and have been winning awards since. From guest houses to Microsoft and the government. No client is too large or small for us. We've been designing websites since the pre-Google age. View our 22 year history. As with many inventions this site came about by necessity when I tried to charter a yacht in Greece over the Internet. As I spent many hours trawling through individual charter company web sites I couldn't help thinking "Surely there must be an easier way than this!" Now, after hundreds of hours of development, there is - Yacht Charter Guide. 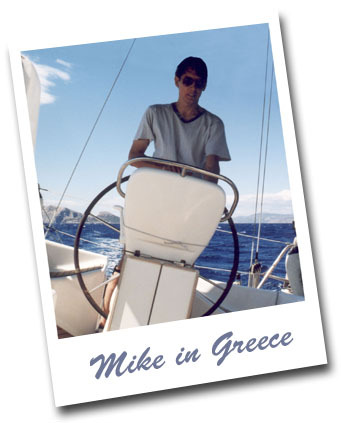 Since his early teenage years sailing has been Mike's passion. He qualified as an RYA Dayskipper by the age of sixteen and now has his commercial Yachtmaster ticket. He enjoys the freedom and value of chartering yachts where and when he likes. We have been established as the most comprehensive list of yacht charter companies for well over a decade. To see how many listings there are in our database or how many visitors our site attracts take a look at our statistics site. The site is featured in April 2006's Newsweek magazine and our reviews are now being used by World Reviewer. Yacht Charter Guide is developed, owned and run by Yachting Limited. We are always keen to listen to your ideas about how we can improve our sites. If you have feedback we would be delighted to hear it. Yacht Charter Guide is registered trademark number 2450650.